Join historian Suzannah Lipscomb as she reveals the hidden secrets of palaces, castles, theatres and abbeys to uncover the stories of Tudor England. From the famous palace at Hampton Court where dangerous court intrigue was rife, to less well-known houses, such as Anne Boleyn's childhood home at Hever Castle or Tutbury Castle where Mary Queen of Scots was imprisoned, follow in the footsteps of the Tudors in the places that they knew. In the corridors of power and the courtyards of country houses we meet the passionate but tragic Kateryn Parr, Henry VIII's last wife, Lady Jane Grey the nine-day queen, and hear how Sir Walter Raleigh planned his trip to the New World. This lively and engaging book reveals the rich history of the Tudors and paints a vivid and captivating picture of what it would have been like to live in Tudor England. "Lipscomb is an eloquent tour-guide, and each of her 50 destinations allows her deftly to unfold a different chapter of Tudor history ... As a pocket-guide to the dynasty of brutes, this is as good as it gets"
Dr Suzannah Lipscomb is an historian, broadcaster and award-winning academic. She holds a BA (Hons) First in History and M.St. in Historical Research from Lincoln College, Oxford, and a D.Phil. in History from Balliol College, Oxford. Following posts as Research Curator at Hampton Court Palace, and Lecturer in Early Modern History at the University of East Anglia, she is now Convenor for History and Senior Lecturer in Early Modern History at New College of the Humanities, London, and is a Fellow of the Royal Historical Society. Suzannah has presented historical documentaries on BBC4, ITV, Channel 5 and National Geographic Channel, and writes a regular column for History Today. 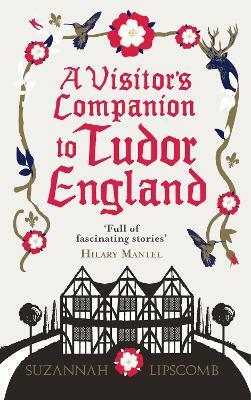 Her other books include 1536: The Year that Changed Henry VIII and The King is Dead! The Last Will and Testament of Henry VIII; and (co-edited) Henry VIII and the Court: Art, Politics and Performance.